Let us all welcome the year 2013 with varied ideas to bring home tax planning for you and your family and also take you through Investment Strategies for investing your money. 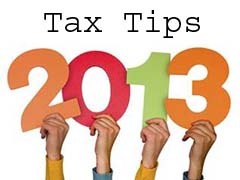 The following thirteen important Tax and Investment Tips for the year 2013 will surely help you to achieve your desired results. It is time now for every tax payer of the country to make a resolution to have a separate independent Income-tax File for every member in the family. The objective of this is to achieve tax planning and cut down on your income-tax payments. Firstly think of your wife and if she does not have till now a separate independent Income-tax File, then start of having such independent Income-tax File for your wife. The concept of gift and loans in the name of your wife will help you to achieve this. However, do remember that your wife can receive gift from any relative other than her husband, her father in law and her mother in law. However, wife is free to take loan with reasonable interest from anyone including the husband. Similarly adopt the concept of gifting your major children and start having separate independent Income-tax File for your major children. If you are a Hindu, then it is time now to find out whether you have a separate independent Income-tax File of your Hindu Undivided Family. If still now you have not been instrumental in opening a separate Income-tax File for your Hindu Undivided Family, then right now is the time when you should start such separate Income-tax File in your family so that it helps you in the process of tax planning. The HUF file apart from enjoying the basic income-tax exemption of Rs. 2,00,000 will also continue to enjoy tax deduction in terms of section 80C as well as deduction for interest on housing loans. Also do remember that your HUF file can come into existence whether you have a son or just a daughter and even if you do not have any children, still your HUF file can come into existence right now. If you are having a minor child or a grand child, plan right now the different strategies for the safety and security of your minor child in particular. If you want to have lots of income and wealth in the name of the minor child and would still like no clubbing of the income of the minor child, then it is time now to think of creating a separate independent hundred per cent “Specific Beneficiary Trust” in the name of the minor child based on the principles enunciated by the various courts of India including the Supreme Court of India so that the income of the minor child with special terms and conditions mentioned in the Trust Deed is not clubbed with the income of the parents. It is also possible for you to think of starting a PPF account in the name of the minor child for his or her safety and also do not forget to take out Life Insurance Policies specially in the name of your minor child which will help the process of investment strategy in the years to come for the safety, security of your loving children. In the year 2013 in case you are thinking of buying your sweet home, then at that point of time do consider various vistas of tax and investment planning and then only take a decision to buy the property in the name of a particular member of the family. Generally speaking, it will be worthwhile to buy the property in joint names so as to reap the full fruits of tax and investment planning. Please do note that every co-owner of the property will enjoy a separate deduction of interest on housing loan up to Rs. 1,50,000 per annum and would also enjoy deduction in respect of repayment of the housing loan and plan now for your Real Estate to grow. Simultaneously, do not forget to keep in mind the provisions of the Wealth Tax Law so as to take care of wealth tax liability in respect of Real Estate or plan your wealth tax matter in such a manner that keeping in view the provisions contained in the Wealth-tax Law wealth-tax is not attracted on your Real Estate investment. It would also be a good idea to think of Rental Real Estate investment with the basic aim of getting a fixed secured rental income and lower tax incidence which is made possible through the special tax deduction at the rate of 30 per cent available for repairs etc. We pray to the Almighty God to give you a good rise in your salary package in the year 2013. It may also be possible that you might be thinking of changing your job. In all situations namely when you get a good rise in salary or when you shift your service, then in both these situations do take care with regard to income-tax provisions contained in the Income-tax Law to save tax on your salary and perquisites. Study in greater detail the provisions contained specially in Income-tax Rules to get hold various of tax free allowances and perquisites for you during the year 2013. It is time now for you to even design your salary package and finally keep a strict watch on the comparatively recent new circular of the Central Board of Direct Taxes dealing with various aspects connected with taxation of salary income which will help you to save your taxes. Likewise, while you make contribution in the year 2013 to Provident Fund, please keep a strict watch during the year because the definition of salary for the purposes of Provident Fund is expected to be amended. Hence, your contribution as well as the contribution of your employer during the year 2013 has to be definitely in tune with the new provisions based on the change of the definition of salary. Whether you like it or not but the fact remains that in the year 2013 the big tax payers in particular and more specifically the corporate tax payers will have to gear themselves to understand the provisions concerning General Anti Avoidance Rules popularly known as GAAR. It is a well known fact that even today the provisions concerning GAAR are contained in the Income-tax Act, 1961 as per the budget proposals made last year namely in the year 2012. But these provisions relating to GAAR will become applicable from 1st April 2013. The tax payers should carefully watch the provisions contained in the Finance Bill 2013 to find out the latest update with reference to GAAR and the tax payers particularly the big tax payers should make a deep study into the provisions concerning GAAR so that they do not face problem at a future point of time. It may also be noted that the purpose of GAAR is to ensure that the tax provisions are not misused by the tax payers and that is the reason that the provision of GAAR requires utmost care and concentration and study of the subject matter. It is even possible that the provisions concerning GAAR may be completely done away with in the statute book. But the final verdict of the Government will be known only when the Finance Bill 2013 is presented. Hence, carefully study the new tax provisions as and when introduced through the Finance Bill 2013. If in the year 2013 you are going to receive certain amount by way of Capital Gain, then before making your decision to sell your assets, find out in the first place whether the gain arising to you is a Short-term Capital Gain or is it a Long-term Capital Gain because generally speaking, if you hold the asset for more than thirty six months, only then the gain becomes Long-term Capital Gain and is eligible to various concessions and deductions. Reversely, if the gain happens to be a Short-term Capital Gain, then there is no advantage at all in most cases. However, the shares and mutual funds if sold after holding it for more than twelve months, becomes a Long-term Capital Gain and less than that is a Short-term Capital Gain. Therefore, during the year 2013 at any point of time whenever you are contemplating to sell a particular asset, firstly sit down and calculate the period of holding. It is even possible that just postponing your sale to couple of months later or in some cases couple of days later may enable you to get full advantage of Long-term Capital Gain. Hence, do not sell the asset till you calculate the tax impact thereon. Also take care to save your Long-term Capital Gains either by investing in Capital Gain Bonds or in a residential property or finally investing in shares of certain new companies which are micro and small enterprises so that your tax liability with reference to Long-term Capital Gain becomes a big zero. Cash is king, yes this statement is absolutely true. But during the year 2013, please continue to take care of all your cash transactions keeping in view the tax provisions as contained in the Income-tax Law. Do remember that wrong action of playing with your cash money may result into substantial financial loss to you. Hence, it is time now to remember that in the year 2013 one should be very careful to take care of handling cash in tune with the provisions contained in the Income-tax Act, 1961. Firstly do remember that in your business or profession never make cash payment of an expenditure exceeding Rs. 20,000 on one single day to one party or else take the expenses so incurred by you will be disallowed within the provisions of the Income-tax Law. This limit, however, happens to be Rs.35,000 for payment to transporters etc. Similarly, do take care to see that during the year 2013 you never make cash loan or repay the existing loan by cash of an amount of Rs. 20,000. The provisions contained in the Income-tax Act specifically provides levy of very very harsh penalties for taking cash loan and or repayment of the cash loan in which case the penalty is equal to the amount of loan. Hence, stop blaming right now the tax provisions but just concentrate on complying with the provisions contained in the Income-tax Law relating to cash payment. All tax payers should keep a watch over the changes which are going to be proposed through the Direct Taxes Code. We are not sure whether the Direct Taxes Code or DTC will be presented in the year 2013 but going by the common expectations one can reasonably come to a conclusion that during the year 2013 Direct Taxes Code may be introduced in the Parliament which will completely result into makeover of the Income-tax Act, 1961. Hence, we should carefully peep into all the intricate provisions contained in the Direct Tax Code so that we can plan our tax and investment strategy for the years to come keeping in view the proposed amendments introduced in the tax laws of the country through the Direct Taxes Code. The investment strategy for you and your family will have to be geared up with new dimension specially after the coming into operation of the Direct Taxes Code. As soon as the Direct Taxes Code is presented it would be a good idea to forget all about the Income-tax Act and to concentrate on the deep study of the new Direct Taxes Code. As soon as the new Code is presented, all the tax payers of India must carefully screen the new provisions and should plan their strategy and tax planning in the years to come. Please focus your investment strategy for the year 2013 on investment vistas connected with New Pension Scheme. Although by now the New Pension Scheme popularly known as NPS is into operation for the last couple of years. However, still now NPS investment has not become the darling of tax payers of India. However, it is time now to show your love and affection to the investment in new Pension Scheme. It is time now for you to study the new provisions in greater detail and try to open separate NPS account for different members in your family. For those tax payers who are having high income and wealth, it is recommended that two tier account in NPS should also be obtained. Finally if you are going to complete sixty years of age during the year 2013, then you should be more careful to immediately open NPS account in your name. This is mainly because of the fact that once you have completed sixty years of age, you cannot open a new NPS Account. Please note that after sixty years of age one cannot go in for opening an NPS account. But if you have already opened NPS account, then you can continue contributing in the said account. Hence, in the year 2013 you should aim at bringing NPS as a preferred tool of investment in your family. Are you adequately insured ? Let this question be asked by every adult income-tax payer in his family. I would like every tax payer to take care of securing his family during the year against calamity. One of the best way to protect the family is to adequately insure all the family members. It is time now for you not just to count your Life Insurance Policies for different members in the family but to sit down and ponder whether all the family members are adequately insured. In most cases I am sure the answer that will come in conclusion would be that most of the family members are not adequately insured. Hence, during the year 2013 please take a call to answer the question whether you and your family members are adequately insured. Do not forget to take an insurance policy for your dear loving daughter too. For all those tax payers who have never had any exposure in the stock market let the year 2013 be their first year for investing in the stock market. Firstly the action plan to enter into the stock market would be to open a Demat Account in your name. To inspire all those who have never had any exposure in the stock market tax incentive is being made available in the Income-tax Law in terms of the provision contained in section 80CCG whereby first time investors in the stock market can go in for making investment up to Rs. 50,000 and enjoy a tax deduction equal to 50 per cent of such investment. Thus, tax saving can be made by taking an exposure to Rajiv Gandhi Equity Investment Scheme and thereby cutting down your tax payment by Rs. 2,500 to Rs. 5,000. All those who are big spenders should be very careful in the year 2013 because Government is going to keep a strict 360 Degree watch on such spenders because the Income-tax Department has been collecting data in respect of its 360 Degree High Profile Spenders. It may be noted that there is no problem in your spending the money for the purpose which you like. But what is relevant is that you should have adequate sources and resources to prove the spending by you. Hence, in the year 2013 do keep records and details of high spending by you in different vistas so that if the tax radar comes to you, you can adequately answer about the spending by you either on holidays or on big purchase of assets etc.